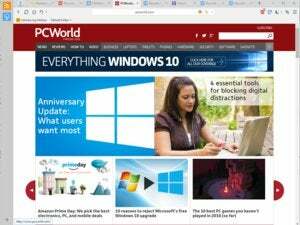 Maxthon is probably the best Web browser you've never heard of. I reviewed it favorably in the past, when it resembled a cousin of Internet Explorer 7. Since then, it's changed drastically. Maxthon includes two built-in rendering engines, Webkit and Trident, and you can switch between them with a click,which means no website should be incompatible when browsing. One of the best uses for this is to visit ancient sites (like for work) that only work with Internet Explorer. Maxthon can even search multiple search engines and display the results side by side--nice when Google isn't your only thing. This feature in particular is unique to Maxthon and gives you a nice, all-encompassing search across many competitive search engines. There's something to be said for Bing, after all, and running it in a column next to Google is wise. The Maxthon browser includes an ad blocker, a screenshot taker, and even a YouTube downloader out of the box. It's loaded with icons. I especially like that it's got ad blocker standard, as it seems ads are becoming more intrusive all the time, and a simple pop-up blocker just doesn't do the trick anymore. All these are benefits if you like lots of options. However, Maxthon's browser bar (and the left side of the screen in full-screen mode) is loaded with icons. I counted at least ten. Some of these these icons don't have tooltips, so you don't know what they do. Having so many things to click made me long for Google Chrome's stark simplicity. Maxthon is for those who want to download a browser and have it include everything you could possibly need out of the box, but still be customizable. Maxthon has that. You can reorganize how it looks, download skins, take away the icons, download add-ons, and so on. No other browser lets you do so much to mess with it. And the fact that it's got two different rendering engines to choose from doesn't slow it down at all - it's a very speedy browser. So there's a yin and yang with Maxthon; it's a fast, good browser with a ton of features, and is extraordinarily popular overseas (especially China), but including so many things to do that distract from the basic, Web browsing experience may be too much of a good thing.